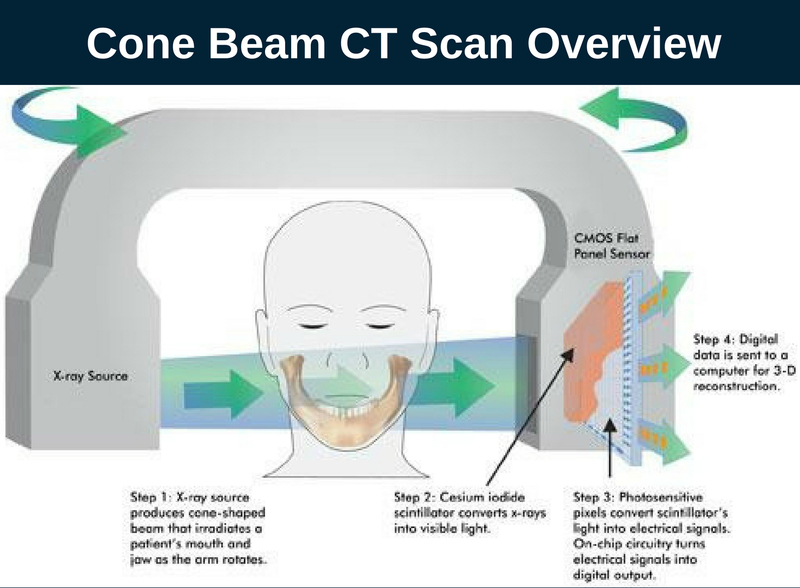 Dental cone beam CT technology allows carrying out a 3D scan with extremely low radiation load. The CT scanner allows you to obtain high-precision images using the cone beam. Such an ultra-low dose is comparable to a natural background and is not capable of having any negative impact on the human body. 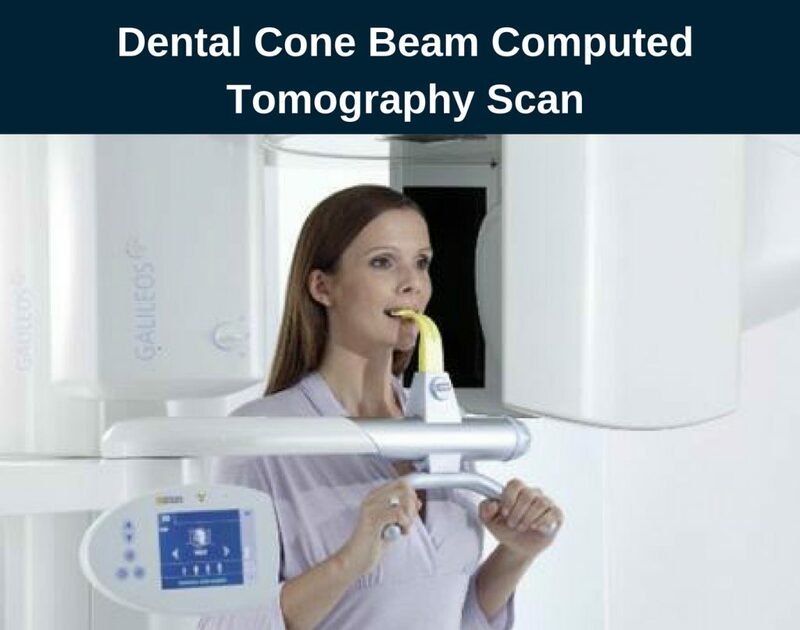 Dental cone beam computed tomography (CT) is a special type of X-ray machine. It used in cases where regular dental X-rays are not enough. Computed tomography is one of the most accurate diagnostic methods used in our days. This type of CT scanner employs a special type of technology to produce 3D images of dental structures, nerve paths, soft tissues, and the bone in the craniofacial region in a single scan. Images acquired with CBCT allow making a correct treatment planning. CT shows a 3D view of the oral cavity and the adjacent tissues. 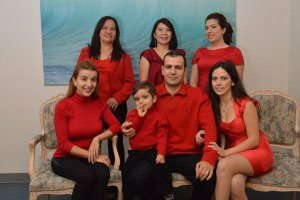 Dr. Sahakyan at My Dentist Burbank, recommends that patients do it before the surgical procedures. The dentist uses CT scan in order to accurately plan the treatment and assess the condition of the bone tissue, its thickness. All of this is analyzed in three planes. If you want to make an appointment for a consultation with the best Dentist in Burbank, please call 1-818-578-2332 for an appointment today. • Exact placement of dental implants. • Assessment of the jaw, nerve canals, nasal cavity, and sinuses. • Measuring, detecting and treating jaw tumors. • Locating the origin of pathology or ache. What Is the Essence of the Dental Cone Beam CT? The essence of cone beam computed tomography during implantation consists of scanning the selected area of the X-ray examination. Then the computer constructs the 3D computer model on the basis of images taken in all planes and at different angles. Implantation of teeth is one of the best and most effective ways to restore missing teeth. Especially if next to the missing tooth are healthy. The service life of a properly installed implant is several tens of years, in many cases, dental implants are for life. No other kind of dental prosthetics guarantees such a long service life. The main condition for any successful implantation is the compliance with certain conditions of the surgery. A great importance in the implantation of teeth is given to correct diagnosis and precise planning of the process. This minimizes the occurrence of risks. To do this, the cone beam computed tomography is used. When implanting the teeth, a CT of the jaws and a tomogram of the sinuses of the upper jaw are used. 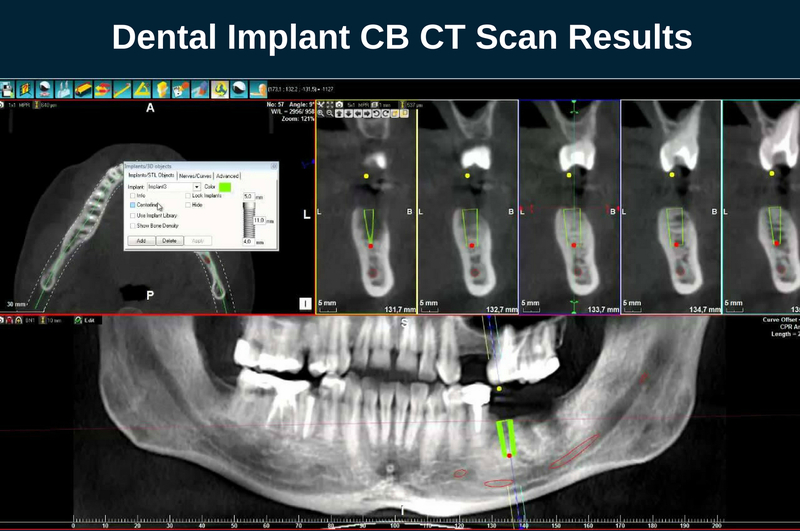 CBCT technology helps in the planning of implantation, taking into account all the tasks assigned. The implant of the tooth is installed where it is necessary for aesthetic and functional prosthetics. In contrast, if there is a lack of bone, then the computed tomography helps to understand how is it best to install the implant. According to the tomogram, the Burbank dentist will determine the type of bone shortage and plan the bone build-up, if its volume is still not enough. In addition, the 3D image provided by CT scan helps to plan the surgery in volume, taking into account the angle, the implant inclination, the location of the implant axis in the bone. In What Stages will Dental CBCT Need? Cone beam computed tomography is mostly needed before implantation and prosthetics. 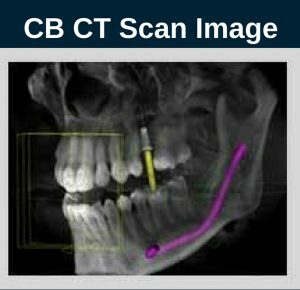 Before the beginning of implantation, CBCT helps the dentist Burbank to choose the most suitable method for installing artificial roots for further prosthetics. It is especially important to calculate the angle of inclination of the implants in the bone. After all, the accuracy of the calculation will depend on the simplicity of prosthetics, the life of the implant and orthopedic structures, as well as the aesthetic result. Cone beam computed tomography will also be needed during the planning of implantation and prosthetics. This will allow making a model of the future restoration of teeth: to model the installation of a screw in the bone, to calculate the most accurate direction and location in the jaw. As a result, it is made possible to select the most suitable implants, as well as prostheses. After all, the main guarantee for a quality crown installation is cone beam computed tomography. During and after implantation, the tomogram will allow you to assess the quality of the screw installation. It will also allow you to calculate the duration of its engraftment, and in time eliminate the difficulties invisible to the naked eye. Dr. Sahakyan recommends scan and examination after implantation at least once a year. During a cone beam CT scan, the machine rotates around the patient head in a complete 360-degree rotation. It captures multiple images from different angles using a cone-shaped X-ray beam. In a single rotation, the detector can generate two-dimensional images, which are then digitally combined to form a three-dimensional image. When carrying out computer tomography, the irradiation zone is limited to a beam similar to a cone. Such a beam penetrates through a small portion of the jaw, which is subject to diagnosis. As a result of the procedure, a 3D image with an excellent resolution is obtained. When cone beam computed tomography is performed, the patient receives the minimum dose of radiation. As a result, in a few minutes, an ideally reproduced digital 3D image emerges. After the diagnosis, the Burbank dentist receives accurate, complete information about the structure, shape, position of the jaw, teeth, maxillofacial area, and maxillary sinuses. Study of dental diseases, gums became more informative due to 3D reconstruction. Cone beam CT scan gives the dentist the opportunity to study the desired area at any angle, at any cut, in the desired plane. This diagnostic procedure gives all the information necessary for the surgery. As a result of cone beam computed tomography, an unlimited number of sections is obtained. 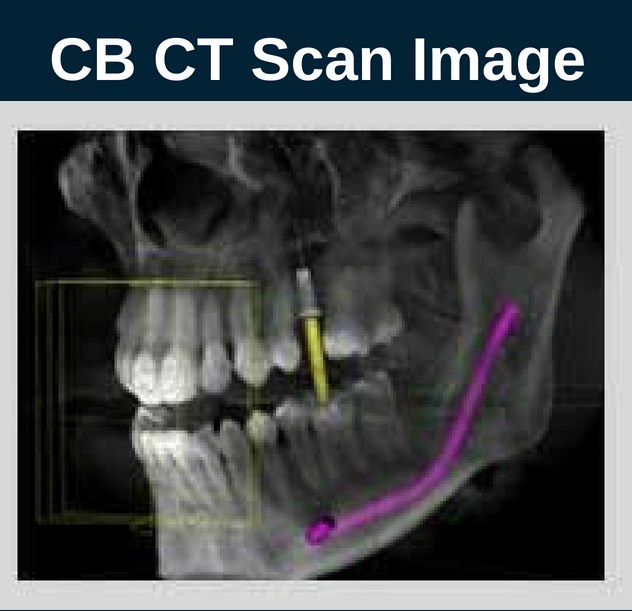 CBCT is able to determine the thickness, height of the bone tissue. The distance of the implant to the nerve is calculated to within 1 mm. The size and the type of the implant is selected taking into account all the patient’s individual characteristics. ● The maximum accuracy and rapidity. Radiation transmitted by this X-ray is much less than the average radiation from other radiological devices for diagnosis. The effect of radiation is rapidly reduced to a minimum. In addition, a high-quality image is obtained, which can be analyzed in different sections. So you do not need to repeat several scans and get more radiation as a result as with traditional X-Rays. A progressive program of planning and CT scan has the ability to plan the entire treatment, using the implants available in the program. You can see how things will look after the procedure. The scan itself of computed tomography takes up to 15 seconds. In each individual case, the type and the size of computed tomography are selected in accordance with the treatment plan. Taking into account the condition of the patient’s oral cavity, one or both jaws are scanned. Thanks to the preliminary computer planning great results are achieved in dental implantation. It is possible to accurately determine the type and the size of the implant required, as well as the depth and angle at which it should be installed. A computed 3D tomogram is created and decoded by the best dentists in Burbank at My Dentist Burbank, who have successfully completed training on computed tomography. Our dentists constantly improve their qualification level during professional improvement events. My Dentist Burbank gives a beautiful and healthy smile every day. Please call 1-818-578-2332 for an appointment today.